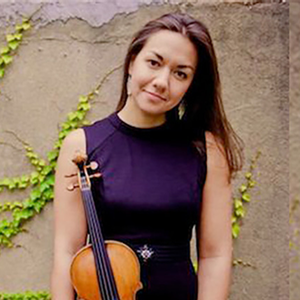 Noted by The New York Times for giving "the proceedings an invaluable central thread of integrity and stylishness" and having "played with soulful flair," violinist Ariana Kim made her New York recital debut at Carnegie's Weill Hall in 2008 and is now in her fourth year as a professor at Cornell University. At 16, Ariana made her solo debut with the St. Paul Chamber Orchestra and at 24 was appointed acting concertmaster of the Louisiana Philharmonic in New Orleans; she has since become one of the most respected artists of her generation. An avid chamber musician of both the contemporary and traditional literature, Ariana now marks her 10th season as a member of the New Yorker-acclaimed New York new music ensemble, Ne(x)tworks, with whom she improvises, performs, composes, and records. Their debut CD of Earle Brown chamber works on the Mode Records label has now been followed by two self-release albums. In 2013, they made their international debut at the John Cage Festival in Berlin performing Cage’s “Song Books” to a packed house alongside the Maulwerker Company. She now marks her 9th season with The Knights, a New York-based imaginative and diverse musical collective that performs programs ranging from string quartets to bluegrass tunes and Mid-East folk music, to the great chamber orchestra masterpieces of the 20th century. In January of 2015, the group released its seventh album, …the ground beneath our feet – a collection of live performances from a recent U.S. tour – for Warner Classics, on which Ariana is a featured soloist in Steve Reich’s Duet for two violins and strings, alongside Guillaume Pirard; that track has since received much acclaim and was chosen as one of NPR's "Songs We Love” for 2015. Ariana finds another musical home in her native Twin Cities as she is now in her 11th season with the Chamber Music Society of Minnesota, which presents a series of five, highly regarded subscription concerts each season, built on the legacy that the great Louis Krasner began with Dimitri Mitropoulos in the 1940s. Collaborations with the CMSM have included performances with pianist Leon Fleisher, violinist Robert Mann, cellists Fred Sherry and Peter Wiley, violists Samuel Rhodes and Nobuko Imai, and clarinetist Charles Neidich, among others. Ariana has spent summers in the immersive chamber music worlds of the Ravinia's Steans Institute, Yellow Barn, and Orford Centre d'Arts. A passionate pedagogue, Ariana spends much of the academic year teaching and mentoring a full studio of talented collegiate students at Cornell; during the months of July and August, she serves on the faculty of the Palo Alto Chamber Music Workshop, the Northern Lights Chamber Music Institute, and the Crowden Music Center Chamber Music Institute. She volunteers annually with two Title One schools in San Jose, CA and has presented master classes throughout the U.S. at such institutions as Kent State University, The MacPhail Center, Vanderbilt University, and the Massachusetts Institute of Technology. Currently, Ariana co-resides in Ithaca and New York City where she received her Doctor of Musical Arts degree from Juilliard under the tutelage of Robert Mann. She spent the last six months living, performing, and teaching in Italy on sabbatical from Cornell, and released her first solo album, "Routes of Evanescence" of music by American women composers in December 2015.